Keep it simple stupid. He didn’t exactly say it in those words, but he certainly implied it! 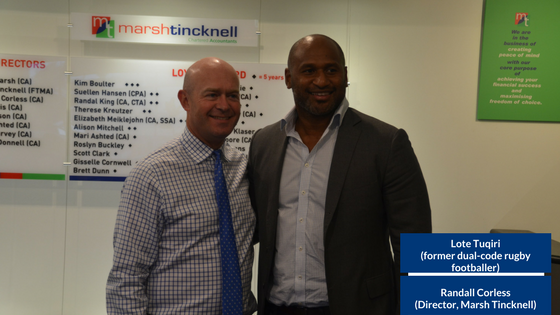 Marsh Tincknell was lucky recently to have footballing great Lote Tuqiri in our boardroom, where he chatted about the highs and lows, and lessons learned during the course of his stellar 15-season career. The man who played for two countries, represented two states, in two codes, won two NRL premierships and appeared in two Rugby World Cups, provided some wonderful insight into what it took to reach and then stay at the top. It was while he was talking about his “luke warm” approach to training that Lote referenced what he saw today as an unnecessarily complex approach to the pursuit of “high performance”. “I fear sports science has high-jacked the world of professional sport,” he said. “It’s become so technical and sophisticated, I think we’ve almost forgotten we’re dealing with humans. We are weighed before training. We are weighed after training. We’re weighed before the game, and after the same. Your BMI has to be this, your skin folds need to be this. All the information and instructions might help some athletes, but I reckon for most, it just gives them too much to think about. Tuqiri’s other concern is the apparent obsession that high performance coaches now have with speed and strength, which he says are being pursued at the expense of skill development. “Speed and muscle mass are clearly important, but it doesn’t matter how fast you can run, or how many tackles you can break if you can’t hold onto the ball,” he says. “There’s got to be a better balance.